Protecting data is important, but the cost and complexity often prevent small companies and departments from deploying DR, because even the lowest-cost iSCSI storage and entry licensing storage replication are expensive by most measures. Backup alone cannot provide for rapid failover or recovery from a disaster, but DR for VMs can now be done affordably across Drobo storage or from other storage to Drobo using vSphere replication and SRM. Drobo provides superior data protection with BeyondRAID technology in a package that is very affordable. Without the cost burden of built-in features, customers have the freedom to combine best-of-breed technologies tailored to their requirements. Combining Drobo as dissimilar storage in a vSphere replication solution means lower procurement cost and even lower cost to grow and manage over time. Small and medium businesses have historically been unable to implement disaster recover (DR) with replication. They depended on backup alone, which cannot provide recover time that's fast enough. The fact is that DR is complicated—and even with dedicated experts on staff, small organisations cannot manage the complexity. The cost of duplicate hardware at two sites plus the cost of storage-based replication is another gating factor. Server virtualisation initiatives, however, have been implemented in SMBs to reduce costs and to increase service levels. And this in turn creates new opportunity for those SMBs to look at DR.
Server virtualisation provides a unique opportunity for greater flexibility and cost reduction. Management and orchestration can be performed from a central place with virtualisation, allowing for a repeatable recovery plan that can be tested and demonstrated. Simplicity is key, with no need to rely on complex procedures and operations for recovery. What's more, server CPU and memory are abundant in the virtualisation architecture, complemented by software solutions for replication. In summary, virtualisation enables cost reductions in hardware and premium-priced storage replication for DR capabilities with dissimilar storage hardware. VMware Site Recovery Manager (SRM) was designed to simplify DR by eliminating complex runbooks and orchestrating the workflow of failover, enabling automation of processes in the workflow. New in VMware SRM version 5 is vSphere replication: a combination of an agent built into vSphere 5 and a replication management server licensed with SRM and running as a VM. With vSphere replication, you can asynchronously replicate VMs from one location to another without the need for storage array-based replication. The offsite location can be a second location or even a cloud provider. By controlling the replication in software, customers can replicate between sites with dissimilar SAN hardware, which is not possible with arraybased replication. Not only is primary storage more affordable, but the cost of storage hardware at the remote site is also more affordable. Since most SMBs cannot afford duplicate hardware at two sites and really want DR only for a select subset of applications while they recover the primary site. Operations such as migration of VMs between sites for maintenance and testing is simplified once SRM is in place, a big benefit for SMBs as these operations certainly occur more frequently than unplanned disasters. Using wizard-driven process, configure connection pairing in Site Recovery Manager. Set up inventory mappings for recovery site resources for folders, networks, resource pools. Make placeholder datastore on the Drobo accessible to servers at the recovery site. Set up protection group(s) covering entire datastore and all VMs for desired group. Specify recovery plan and customise recovery for individual VMs. Configure priority groups and dependencies. Test and execute recovery plans, you now have DR that is simple and affordable! Site Recovery Manager with vSphere Replication. Protecting data is important, but cost and complexity prevent small companies and departments from deploying DR, because even the lowest-cost iSCSI storage and entry licensing storage replication are expensive by most measures. Backup alone cannot provide for rapid failover or recovery from a disaster, but DR for VMs can now be done affordably across Drobo storage or from other storage to Drobo using vSphere replication and SRM. Drobo provides superior data protection with BeyondRAID technology in a package that is very affordable. Without the cost burden of built-in features, customers have the freedom to combine best-of-breed technologies that are tailored to their requirements. 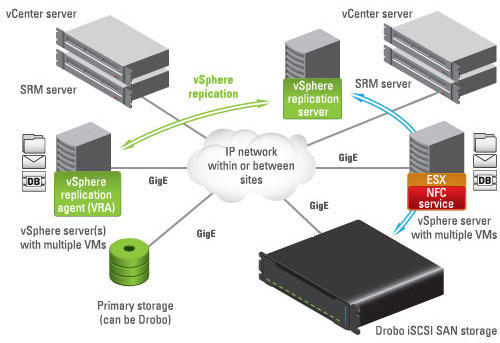 Combining Drobo as dissimilar storage in a vSphere replication solution means lower procurement cost and even lower cost to grow and manage over time. Drobo's incredible ease-of-use represents a huge opportunity to save on operating costs. Both VMware SRM and Drobo offer IT managers cost advantages with sophisticated automation for any sized deployment. For smaller organisations that are especially challenged by budget and complexity, Drobo is the perfect storage solution, allowing them to spend time and energy on applications not infrastructure. For larger organisations, Drobo is a great fit for Tier 2 applications and for smaller departments that need onsite or offsite storage.